Experimental Half-Hour presents Movement & Synthesis November 8th at the Hollywood Theatre with guests modular synth virtuoso Pulse Emitter, Keyon Gaskin with backing band Honey Owens of Miracles Club, and dance company bobbevy performing “This is how we Disappear” choreographed by Suniti Dernovsek. 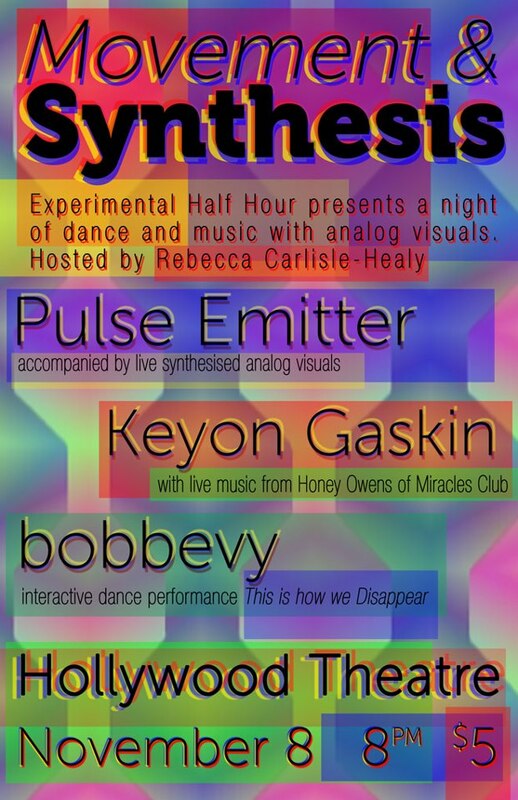 Brock Fansler will be accompanying Pulse Emitter and Keyon Gaskin with live analog synthesized visuals. The evening will be recorded through the facilities of Portland Community Media and broadcast on cable access at a later date. Keyon Gaskin is a movement performance artist, actor, dancer, teacher and choreographer/director. Lately he’s had the joy of playing with: Keith Hennessy (SF), Imago Theatre, Linda Austin, Futro and The Miracles Club, among others. Currently, Keyon is interested in exploration without expectation, limits of perception, and un-defining as sources for creating. This is how we Disappear is an original new work created by Portland based dance company bobbevy. This new work juxtaposes the natural simplicity of time passing with our own experience of human relationships, fraught with frailty, tension and tenderness. Dancers Philippe Bronchtein and Jessica Hightower embody choreographer, Suniti Dernovsek’s unique movement vocabulary, marked by intricacy and expressiveness. This is how we Disappear features visual design by David Stein, sound, composed/generated by Jesse Mejia and real time video by Brian Richardson. Together, the collaborators create a live, interactive performance that blends movement, visual art, sound and video. Eva Aguila and Brock Fansler are the Co-Producer of Experimental Half-Hour. For the past two years they have dedicated their time organizing, shooting, and curating new episodes of Experimental Half-Hour. Aguila, originally from Los Angeles, California relocated to Portland, Oregon after she met Fansler in 2008. In the past Eva has been involved in film, theater, and music. She started as a stage manager at CalArts in 2001. As a stage manager she organized multiple theatrical productions ranging from avant-garde theater, to operas, to traditional african dance performances. While at CalArts she had the pleasure of collaborating with many artist including filmmakers and videographers. She helped produce many student films while attending CalArts. Towards the end of her career at CalArts she participated in the pilot program called Flixus that would later become the staple collaboration between the School of Theater and the School of Film at CalArts. In 2005 she fell in love with experimental music and started her own musical project called Kevin Shields. Needing to take a break from film and theater she started working on musical pieces inspired by experimental filmmaker Stan Brakhage. Since then she has been involved in several other bands and projects throughout the Los Angeles Area. Her discography features releases on Ecstatic Peace, Deathbomb Arc, Blackest Rainbow, and Weird Forest. Aguila has opened for Sonic Youth and has been reviewed in the Wire and Aurthur’s Magazine. In 2010 she decided to reconnect with film/video by starting Experimental Half-Hour with Brock Fansler. Fansler, originally from Quincy, IL by way of New York City, NY has lived in Portland multiple times. Brock got his start in media through the Media Studies program at CUNY-Hunter College where he received a Bachelor of Arts. Musically Brock joined Matt Kimmel to form the experimental duo Crazy Mountain, and later joined the punk band Blood Biker. Fansler has always been exceptional when it comes to technology. His savviness has served many purposes including web programming for the United Nations, Gender Equity Project, Northwest Energy Efficiency Alliance and now facilitating all the technology uses for Experimental Half-Hour. His ambition to master the analog video effects systems has brought Experimental Half-Hour to the forefront of the new video avant-garde movement. Before joining Eva to produce Experimental Half-Hour Brock produced his own cable access program called “Flavor Country,” a monthly showcase of noise musicians. Eva felt inspired by the potential of the cable access studio. She joined Brock in what later became Experimental Half-Hour. Together they work to produce entertaining and unique programing into the art culture of both international and local community of Portland.